Publishers sometimes work in mysterious ways, telling us they might not be able to provide us with a review code due to a sudden shortage. In such a case, we basically have two options: forget about the game coverage or find another to get it without having to slam our money down. Here comes Rouge, who happens to works for a well-known video game retailer in France. This faithful member is actually Gamersyde's Huggy Bear, so we got in touch with him and agreed to meet him in a dark alley for the transaction. That's basically how we got a hold of Crash Bandicoot N. Sane Trilogy on PS4. Here are some videos on PS4 Pro, recorded in 4K though the game's resolution doesn't go above 1440p. More to come when we've finished encoding the rest of our footage. Update: We finally received a code 30 minutes before the embargo lifts, so thanks to Rouge we are on time. Update 5:One last video added. The camera movement is 60fps?.....Or is it just me? Ugh, Drift was that you playing? Your wastefulness of fruit and boxes gave me physical pain!! I was already planning on getting this but now I need digital so I can get it ASAP. I must untrigger myself! Lol I gotcha. 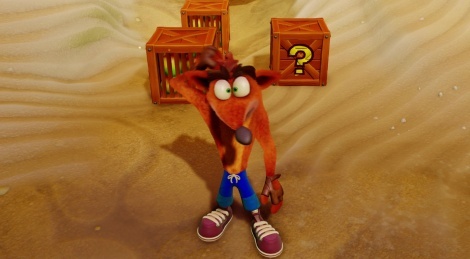 Crash was the first game I played on PS1 so it hits me in the feels. I hope I play better in the third one so you can sleep well tonight. Videos are encoding, but I've just added one more from Crash 2. I hope you at least redeemed yourself in the eyes of the lord by playing CTR - Crash Team Racing (much better than Mario Kart at the time). Otherwise your sinful soul will forever be damned. Also, if you played Spyro: The Dragon games, but didn't Crash Bandicoot, not only will your soul be in eternal damnation, but it will also receive 1.000 times more punishment for an even greater sin! why VV is a mid-tier developer. "Much better than Mario Kart" .... Now that`s HERESY! The nostalgia is strong with this one. I can't even imagine they've aged particularly well, but i still want it. Graphics are great. Absolutely not. I could write a "wall of text", but instead I will leave you with a GameSpot thread on which is better, Crash Team Racing or Mario Kart 64. You will see arguments by many people as to why one is better than the other. Though in the end, Crash Team Racing wins. GameSpot - Which do you prefer? Mario Kart 64 or Crash Team Racing? Outside of these, there's no way to argument which is better. But both critics and users gave Crash Team Racing a higher overall score than Mario Kart 64. So let that be the final word on the subject. Crash Team Racing was all that and a bag of chips! Tbh I couldn't get back into Mario Kart until I played MK7. How is it that your videos is 60 fps, but the game itself runs at 30? 1. it does not change how the game looks in motion (it does not make it smoother in the videos). 2. if we encoded the videos at 30, it might ad some problems the game does not suffer from. And 30 FPS games with bad framepacing would lose some frames, as the simplest way to convert a 60 FPS video to 30 is to remove odd or even frames. Also, this type of game may look smoother sometimes when converted to 30 whereas in reality the bad framepacing introduces stutter, so that would not represent the real game. 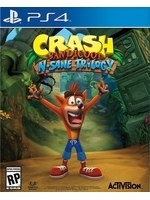 sony need to get naughty dog to make a new one tbh. This looks fantastic, well done VV. oh my god blasphemy. even in my older years, i would never turn up the chance to play the remake.